Each product contains one king-size map (22”x34”) and the same map divided in eight US letter sheets. So, your choice is to print the whole map (maybe through a print server) or print yourself the single pieces and tape them together. 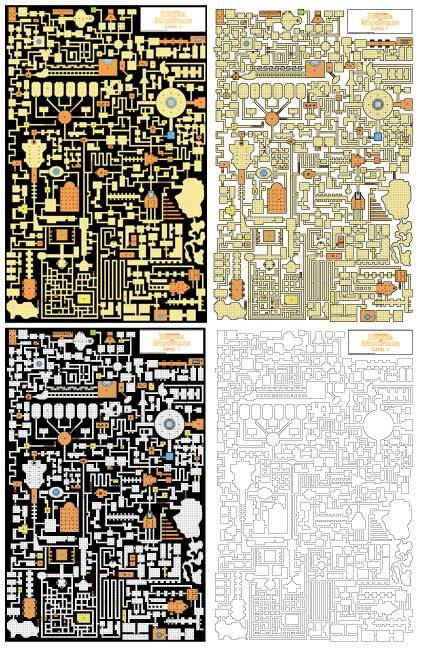 You can print even a small portion of the dungeon and scale it as you see fit since these products are completely vector-based; therefore you will not suffer loss of print resolution. So, you could print out every single room in battlemap-scale, for use with your miniatures. This button will not be printed, so, don’t mind if it covers some rooms. By clicking on this button some options will be shown, as detailed below. Please be aware that each time you make a choice it reflects over the whole document (the 22”x34” map, and the single pieces). Coming up with a physical layout is always the hardest part ..